Last week, Joe and I finally cooked the FREE turkey that was at the bottom of our chest freezer. We don't usually make turkey too often. Like a lot of people, we only eat a turkey dinner for Thanksgiving. We've decided that we're going to try to eat more turkey during the winter months. I made homemade broth with the turkey carcass and also diced the leftover meat and separated in 2 cup portions for future meals. I made a big pot of Turkey Noodle Soup on Tuesday and that turned out to be dinner for two nights in a row. Perfect for a snowy Tuesday night dinner. I'm pretty sure Joe enjoyed having a hot bowl of soup on Wednesday too since he worked outside most of the day on Wednesday. A couple of weeks ago, I found a recipe for Chipotle Turkey Chili online. I knew right away that I wanted to make it, since it would be different than any of the other meals I made with leftover turkey after Thanksgiving. You can view the original recipe here. As with most recipes I try, I adapted this either to simplify or to fit our tastes. cook celery, bell peppers and onions in hot oil for a few minutes over medium heat. The original recipe called for just the diced turkey. When I make chili using beef, I like to use a combination of ground beef and diced london broil. I decided that I wanted a similar texture with the turkey. Having the pre-cooked ground turkey in the freezer made this super-easy! I also think that this would be a perfect recipe for the crock-pot, just throw in all the ingredients and cook on low for 6-8 hours or high for 4 hours. 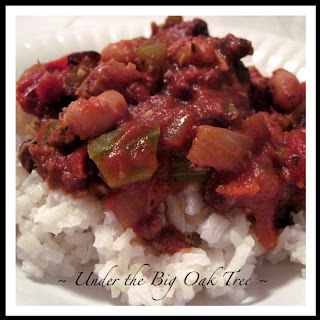 This recipe made a lot of chili and I'm really glad it did! We LOVED it so much that we didn't mind eating it 3 days in a row!!! It was soooo good, I couldn't bring myself to put the leftovers in the freezer (even if they would have fit in the freezer) so we just ate it until it was gone! There is one small container left, perfect for lunch. We really could have gotten a 4th night's dinner out of this pot of chili, but we ate some pretty hearty portions on the last night since we were trying to finish it up! I still have some diced and ground turkey in the freezer, so I have a feeling I'll be making another pot of this yummy chili before the winter is over.....maybe for Super Bowl! Recipes I Can't Wait to Try! I love making turkeys just for the meat. You can use the meat for casseroles, soups, salads, whatever. I LOVE this chili! I love adobo sauce, it's one of my favorite sauces. I've never made a turkey before, only received leftovers from family after Christmas and Thanksgiving. This looks like a perfect way to use it up! LOVE me some chili!! and love that you threw in some adobo sauce. Brilliant Idea! Nothing says comfort food like a good spicy chili and yours is sayin' it loud. Looks great and thanksf for linking to the Hearth and Soul hop this week. Looks great! It's that time of year for some good chili! I'm laughing because I've done the extra turkey thing before. But I'm nowhere near as bad as my mother. If she can get inexpensive turkeys around thanksgiving, she'll buy as many as she can get in the freezer, and then spend the rest of the year complaining that she doesn't have an occasion to cook one. Thanks for sharing your spicy delight with the Hearth and Soul hop. You had me at chipotle! This looks so very tasty! Thanks for sharing on Recipes I Can't Wait to Try! Yum, chipotle sounds like a fantastic thing to add to chili. I can just imagine how wonderful that smoky flavor is in this dish. I am so glad that you brought your Chipotle Turkey Chili, I have a extra Turkey that I need to cook. Your chili looks delicious. 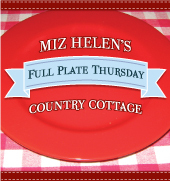 Thank you so much for coming to Full Plate Thursday and please come back! Oh that sounds yummy, and just the kind of recipe I need for trying out my new crock pot! this looks really delicious....i really like chipotle and think the addition of turkey is so smart! thank you for sharing with tuesday night supper club! Congratulations Alison! Your Chipotle Turkey Chili will be featured on Full Plate Thursday this week 1-27-11. It was so good! Hi Alison! Thanks for stopping 'Beneath The Big Oak' and visiting! Miz Helen's is always a great spot to meet new friends. Your Chipotle Chili looks wonderful! Thanks for sharing!